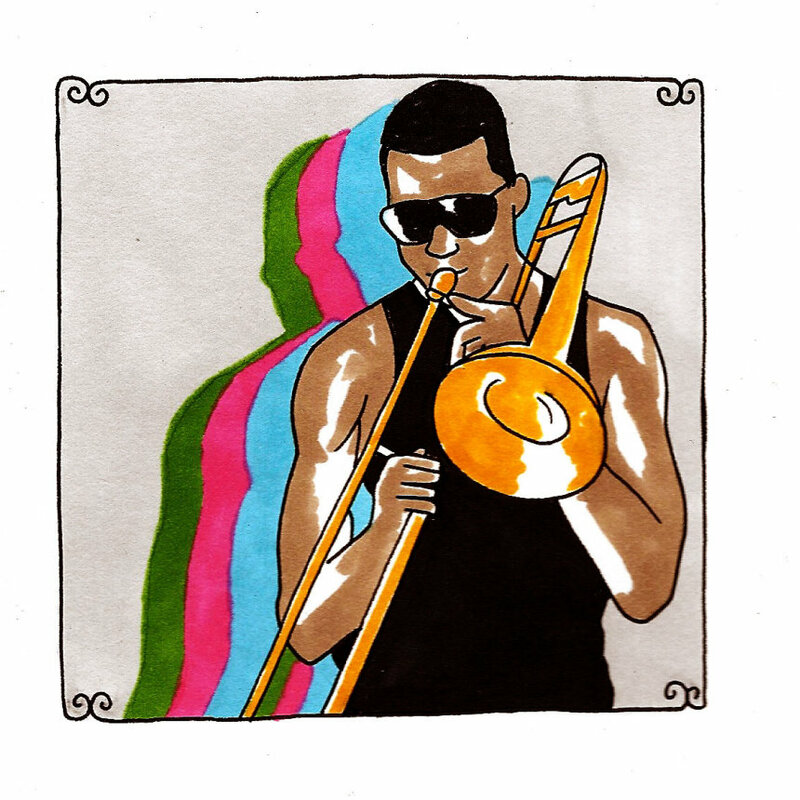 The New Orleans that I'd like to go to, for my first visit, is the one that Trombone Shorty gives us a guided tour of with everything that he and his group, the Orleans Avenue, give us with every number and every interpretation they play. We've heard that there's some great food down there, but where isn't there something special to sample when considering local cuisine? We've heard that it's beautiful and that things are shaping back up down with rebuilding and recovery efforts, but lots of places are beautiful. Beauty's kind of a dime a dozen. The eyes can always be full, anywhere you go. What we sense the most in Trombone Shorty, the stage name of 25-year-old Troy Andrews, is the voodoo that we've been told is synonymous with that city down on the Bayou. It's that twinkling black magic or something that feels forbidden or unattainable that comes through his instrument. It feels like new language, a purple haze, something that's not quite of this world. There's a haunting that Andrews puts to the notes that he blows out. They have within them the funkiness and soul that provide a commonly accepted stepping off point for discussion, but he takes them into darker corners of the swamp, where they pick up their scruff and scuffings. They come out on the other side of his head and his mouth fully diabolical, completely consequential. They have life that's been given to them by some unknown power and the songs carry with them a certain pluck that would have made mothers and fathers calling it the devil's music had Shorty been making it back when Elvis was deemed Satanic for the swivel of his hips and the playing of such unwholesome R&B-infused rock and roll. Trombone Shorty would have stood at the top of the list of banned musical substances should he have been around back in the 1950s. These days, he's still able to steam up the windows and he brings the humidity of something frisky happening between the sheets to much of his music, allowing it to be heard in the way that anyone wants to hear it. He's a true master, already, at his tender age, the product of and interpreter of past greatness. He sounds intent upon giving new life to the music that he grew up with, adding to it whatever gets into his cage at night, whatever spooks, whatever rattles, whatever gives him a romp.